Awareness-raising, discussion activity to educate staff and help reduce this major problem in today's workforce. Using a tried and tested format - sets of mini-task cards for groups to address - you’ll cover a whole range of issues relating to stress at work in a fun, relaxing, non-threatening format. Address the different degrees of stress, the way the word stress means different things and the misconceptions in people’s views of stress. Look at examples of real situations to help identify your own stress indicators and the possible causes. Then consider the merits of common, stress-preventing techniques and how they can be easily implemented and to good effect. Responses are noted on a special handout, for reference at the Debrief. 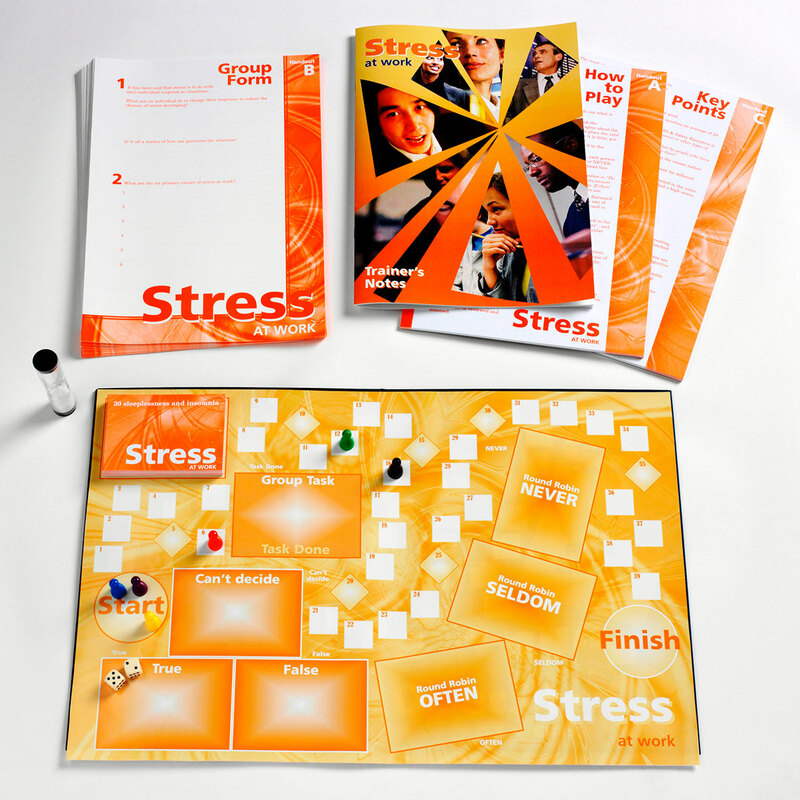 Stimulates great discussion (a stress-buster in itself!). Great, interactive exercise to use on people-management courses. Allocate the board, cards and playing pieces. Lead a discussion and Debrief at the end. Full guidance provided in PowerPoint presentation and Trainer’s Notes. This is a very useful, interactive pack. Participants find it enjoyable. Raises awareness and creates great group discussion toward improving work practices. Very useful. Allowed our delegates to discuss issues in a neutral environment - and come up with their own, practical stress-busting techniques. Everyone who has attended the training has said how great the game is... and how much better they feel! Used in management training with Department Managers and Store Managers, the best learning point was the fact that everyone is different and managers have to consider this when managing their people. The game promotes discussion – even amongst those who do not usually participate at training sessions. A great interactive activity, which helps employees share how they feel, but more importantly, how they can deal with stress at work. A great game which can be used at all levels of the business.